A scourge of toddler mean girls has parents frantic. Says Gina Barreca, a feminist theory professor, to the New York Post, "Our middle schools are now filled with miniature Medeas...Your average little girl makes Vlad the Impaler seem as empathetic as Oprah." To read the article, that doesn't seem like a stretch: we learn about a group of 4-year-old Alphas who refer to themselves as "The A Group" and an 8-year-old's to-do list that reads "1. Clean room (my instructions), 2. Make Nayla miserable, 3. Be mean to Nayla, 4. Pick on Nayla, 5. Terrorize Nayla a bit." Of course, there have always been jerks and cliques, and any parent who doesn't think so hasn't been in First Grade in a while. But what's different is that the behavior's increasingly precocious: kids are, if you believe some experts, more manipulative and more conscious of social leverage. Parents in the article are quick to blame "media" — be it the sassy infants of contemporary TV or the transparent social machinations of social-networking culture. 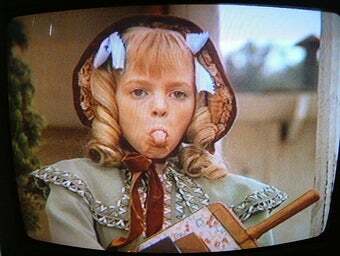 Kids' media always had bad apples, but be it Nellie Olsen or Veruca Salt, they were the bad guys — and they got their comeuppance. What's more, they were always backed by enabling, indulgent adults who encouraged their behavior: the bad kids were spoiled. People have pointed to the Harry Potter books as examples of old-fashioned storytelling, and in that regard it's true: Draco, the bad kid, has bad parents (and the heroes, rather than being precociously sassy, are loyal, kind and smart.) Contrast? Tiny Monsters, a new "South Park for 12-year-old girls." The weird part is, the makers seem to be positioning this as...empowerment. Says executive producer Ali Rushfield, "At the age of 12, [girls reach] the apex of their power...That's as powerful as you get until you potentially become like Hillary Clinton." She's comparing being a Mean Girl bully to Secretary of State. If you're looking for some casual issues, here's food for thought.